My t-shirt said “The mountains are calling and I must go”. I was there, sitting on a rock, in the high country of the eastern Sierra Nevada Mountains. Above me was the granite of the Sierra Crest. In front was a crystalline lake surrounded by trees, some tall and stately, others short and tormented. All of this was fed from the plentiful snow that the crest had wrung from storm clouds. I’d passed a few other hikers in my ascent, but mostly been passed by those climbing faster, and met others coming down after their ascents. 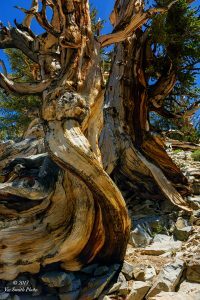 The path to Kearsarge Pass, over the rocky, 12,000 foot treeless crest a thousand feet above us, has been traveled for 150 years by Americans and perhaps a thousand years by the Paiute people. I planned to rise from my respite and head up again. But, as distance runners know, sitting often leads to more sitting. So I drank my water, ate my food, stared at the country around me. The crest towered in the bright noon sun. My feet dangled above a tiny finger of the lake. Trout darted among the rocks and grass of the pool, as their ancestors had done in similar pools for hundreds of millions of years. Gentle waves lapped across the surface, rippling the reflections of mountains, of trees, of clouds, of me staring into a dancing tiny landscape. Maybe it was rationalization and maybe it was revelation, but I soon lost track of my earlier resolve to climb to the crest. I had wanted to complete the calling, to conquer, to stand on top and see the endless mountains, but had found myself instead enthralled by a small vista: a reminder of a web of life, ancient, fragile, and powerful, part of the whole vista I’d sought.